This is the DIRECTV PI-29Z power inserter. It’s been a fixture in homes for nearly a decade. In fact, for the most part you can’t have DIRECTV Satellite TV service without it. But lately, it’s been disappearing from new installs. What’s the deal, and should you still have one on hand? I know this is going to seem silly but a power inserter inserts power. A power inserter (sometimes called a power injector) is more than just a power supply. It puts power on a line that’s also carrying signal. This makes it easy for one cable to feed a satellite dish or multiswitch. Yes, your satellite dish needs power. I’m surprised by how many people don’t realize that a satellite dish needs power to work. It’s not just a passive antenna. Hidden behind the white plastic of the LNB (the front part of the dish) are sensitive electronics that do two things. The super-weak signal from the satellite is amplified using a Low Noise amplifier. Also, the whole Block of satellite signals, which come in on frequencies from 12-40GHz, is converted to frequencies that can travel through a cable more effectively. [Now you might have figured out why they call it an LNB.] The dish does a few more bits of magic too, to help your receiver figure out what kinds of signals are coming down the line. Doing those things takes power. In early satellite systems, that power came straight from the satellite receiver. That worked well but it was inefficient. By the late 2000s it was common to see a power inserter that took care of all the work of powering a dish. If you’ve been with DIRECTV for quite a while, you remember when a satellite installation took a bunch of cables, wires and black boxes. One big goal of changing over to the Genie architecture was to simplify installs. Genie 2 does that. Its single tower takes the place of a wireless video bridge, cinema connection kit and DVR. And, even better, it powers the dish by itself. Four boxes combine into one package. Adding back the power inserter into the DVR was probably the best move, since technicians found that a lot of people unplugged the power inserter not knowing what it is. Then, of course, their satellite stopped working. But should you add that power inserter back in? There are a few cases when you absolutely should use a power inserter even though the Genie 2 doesn’t require it. If you have 300 feet of cable between Genie and dish, put a power inserter somewhere closer. 25-50 feet from the dish is the minimum. If you’re always tinkering, you might want to use a power inserter just to be safe. You could always make the mistake of connecting the Genie 2 to the wrong port. It needs to be connected to the red port on the splitter in order to supply power. 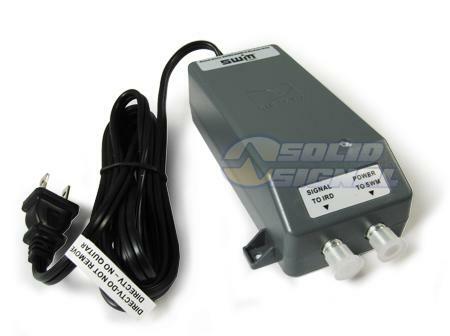 If you have a SWM-30 multiswitch you will need an external power inserter for it. Try leaving a post at http://forum.solidsignal.com or calling for help at 877.312.4547! We can help!